As the Baby Boomer population ages and the number of people with disabilities increases, there’s an ever-growing demand for Medicaid-funded Long-Term Services and Supports (LTSS). To meet this demand, states are increasingly turning to Managed Care Organizations to administer service deliver to both the general Medicaid population and those with complex LTSS needs. From the white paper: Issues like budget shortfalls, the need for predictable costs, and Medicaid expansion under the ACA have resulted in continued growth for managed Medicaid. By 2020, MCO enrollment is expected to account for nearly 85 percent of Medicaid beneficiaries. 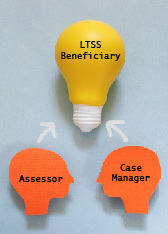 For beneficiaries with complex LTSS needs, state agencies and their managed care partners rely on functional assessment tools to make eligibility determinations and create person-centered care plans. Proponents of managed LTSS argue that providing services an integrated, coordinated fashion lowers costs, reduces hospitalizations and nursing home admissions, and extends the amount of time beneficiaries can live in their communities. Critics, on the other hand, argue that cost savings come at the expense conflict-free, person-centered case management. Holding multiple roles with the beneficiary has the potential to incentivize inappropriate utilization of services, creating a conflict of interest. Conflicts of interest arises when the organization conducting functional assessment and/or creating the person-centered care management plan is also responsible for payment or service delivery. For example, an assessor employed by a service provider has an incentive to recommend more expensive care options. Or, in cases of managed care, have an incentive to limit the number of services delivered. How can Medicaid agencies avoid conflicts of interest? To avoid conflicts of interest, states benefit from turning over plan administration and/or assessments and individualized care planning to a trusted third-party with specific expertise in LTSS care delivery arrangements. How can a third-party assist states and/or MCOs? Eligibility Assessment: Ensure an independent, federally compliant process for accurately determining care and service needs. Person-Centered Care Planning: Promote the least restrictive setting possible, while factoring in the beneficiaries’ goals, preferences, strengths, and functional needs. Provider Quality Oversight: Conduct ongoing monitoring of: 1) provider services in comparison with accepted treatment practices; and 2) adherence to the state’s provider credentialing process. External Quality Review: Improve plan and processes by aggregating information on the timeliness, access, and quality of services. Stakeholder Engagement: Engage as many stakeholders as possible to build relationships, improve processes, and leverage expertise of community-based organizations. Where can I learn more about recognizing conflicts of interest? For more information on what to look for to ensure conflict-free case management for LTSS populations, download the Telligen white paper, Managing Medicaid’s Costliest Members.